The carbohydrate-phobia that swept the country a few years ago really took a toll on the lowly potato. While it is often thought to lack any kind of nutritional content, it is actually a great source of vitamin C, vitamin B6, potassium, and fiber. 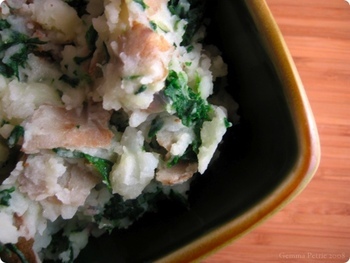 Colcannon is a comforting Irish dish made of mashed potatoes and either kale or cabbage. Many variations of this dish exist, but I like to add shallots, garlic, and sometimes a bit of grated Parmesan to flavor it. Boil the potatoes in salted water until tender. (I always leave the skins on, but feel free to modify.) Meanwhile, heat the oil in a saucepan over medium heat and add the shallot, garlic and kale. Cook until the kale is tender and reduced in volume. Drain the potatoes and return to the pot. Mix in milk, butter, salt and pepper to taste. Add the kale mixture and combine well. Serve warm with a pat of butter or a drizzle of olive oil.